Did you know that June is Men's Health Month? Most of us are malnourished and do not get the amount of vitamins and supplements our bodies need to function. I was just reading an article in the New York Times that Men are now getting osteoporosis too (it was previously believed that the disease only manifested in females). According to the article, "Two million men in the United States have the disease, and one in four will have an osteoporosis-related fracture in his lifetime." This article is 6 years old, so I am sure the numbers have increased. Did you know that exercise, Vitamin D, and Calcium can help prevent osteoporosis? 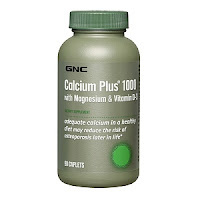 GNC can help supply you prevent Osteoporosis and any other diseases or problems you may have. 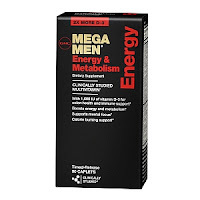 Mega Men Energy & Metabolism has Caffeine and Green Tea Extract along with other energy blends and a LOT of vitamins (including 1600IU of Vitamin D). With most males, the less capsules/ tablets the better. If a vitamin makes the Hubby feel good and energized, he is much more likely to take it. I absolutely love VPX Redline Princess in Exotic Fruit. It is the only energy drink that I actually like the taste of. It has helped me to have the energy to get through many bad late nights at my overnight job. 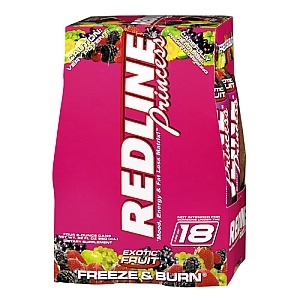 I also love that it does not have any carbs or sugar (even though it tastes super sweet). I am actually allowed to drink this on my diet! What would you buy at GNC if you had a $100 gift card? One lucky reader is going to find out! Giveaway ends 06/23/11 at 9pm EST. Giveaway is for US residents only. No P.O. Boxes. Winner will be chosen randomly. You are not eligible if you have won from GNC in 2011. Winner will be contacted via e-mail and then will have 48 hours to respond before a new winner will be chosen. Giveaway ends 6/23/11 at 9pm EST. Giveaway is for US residents only. No P.O. Boxes. You are not eligible to win if you have already won a prize from GNC in 2011. Winner will be chosen randomly. Winner will be contacted via e-mail and then will have 48 hours to respond before a new winner will be chosen. Disclaimer: I will be receiving a $100 gift card in exchange for this post. I was compensated in any other way. The thoughts here are my own honest opinions.